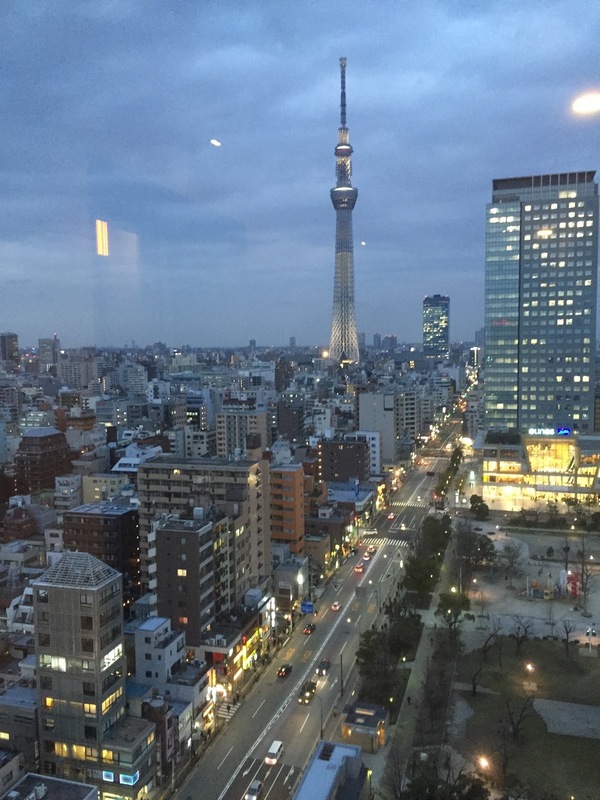 The view from the window next to the elevator on the 16th floor of the hotel. You can go to the observation deck of tower, but you have to stand in a long "rine" for tickets, so we haven't taken the time to "rine up" yet. 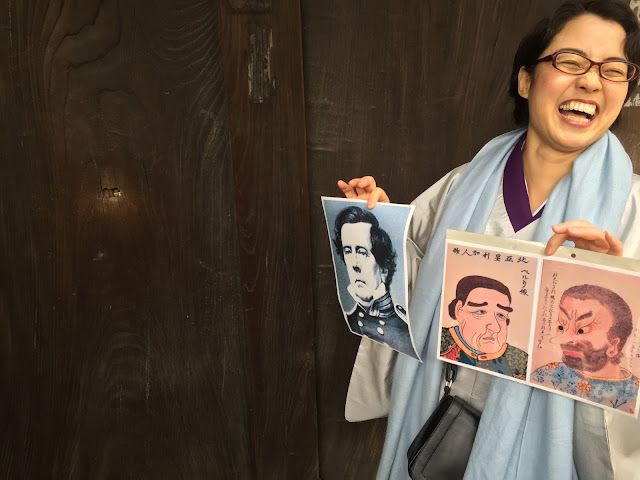 Our guide, Ayano, explains how Matthew Perry brought his black sheeps (ships) to Japan and, in effect, opened up Japan to the world. The two paintings on the right are portraits of Perry, based on verbal descriptions of him. Perry's arrival caused "big problem" in Japan because the Emperor and the people were in favor of being more open, but the Shogun and Samurai class knew their power would be usurped. Ergo, wars between the Emperor and the Shogun. The bullet hole on the left is in the front wall of a temple, evidence of one of the battles that took place in Tokyo. The 15th and last Shogun died about seventy years ago. 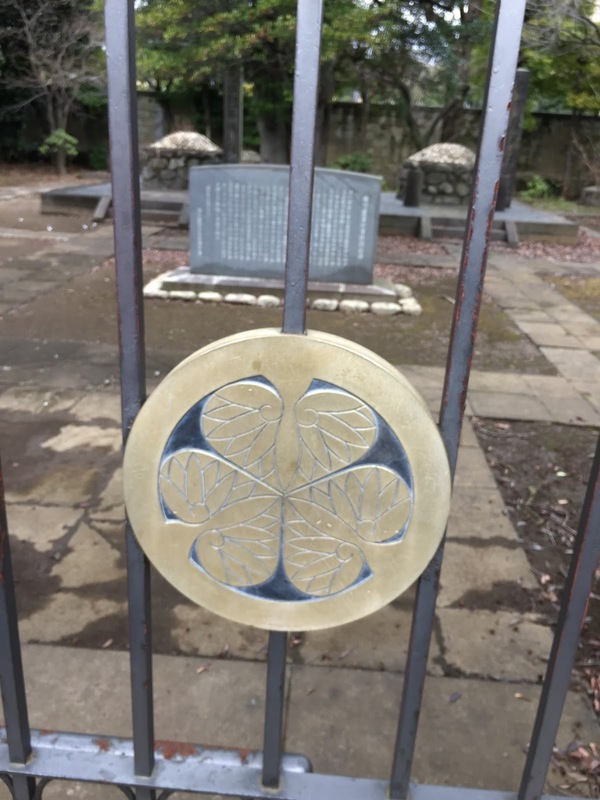 The last Shogun's grave (and his family) is in a cemetery near here. The family crest on the gate represents Hollyhocks. Or maybe Horryhocks. 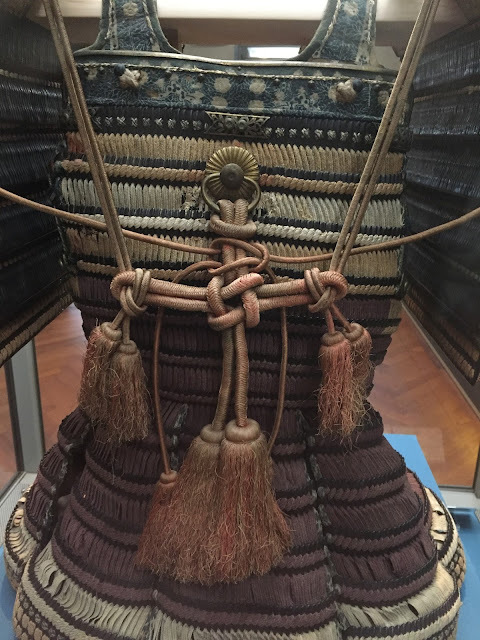 The back of some Shogun warrior armor in the National Museum of Art. Nice knot work. 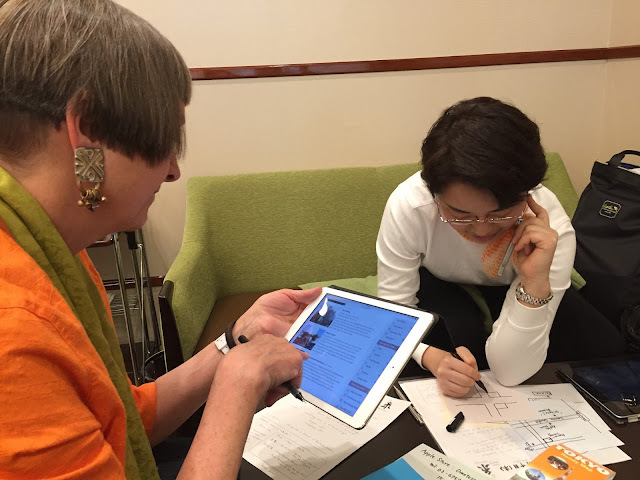 Robin and Ayano make detailed plans of train and subway connections in order for us to meet Lady Matsuzaka on the other side of Tokyo. 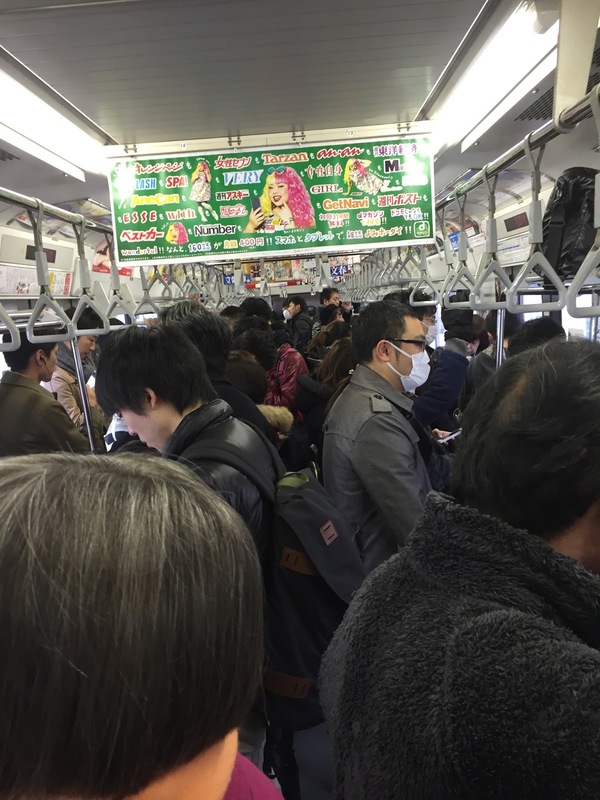 Thanks to Ayano's great planning and Robin's subway/tube experience, we pulled it off like regular Tokyo-ites. 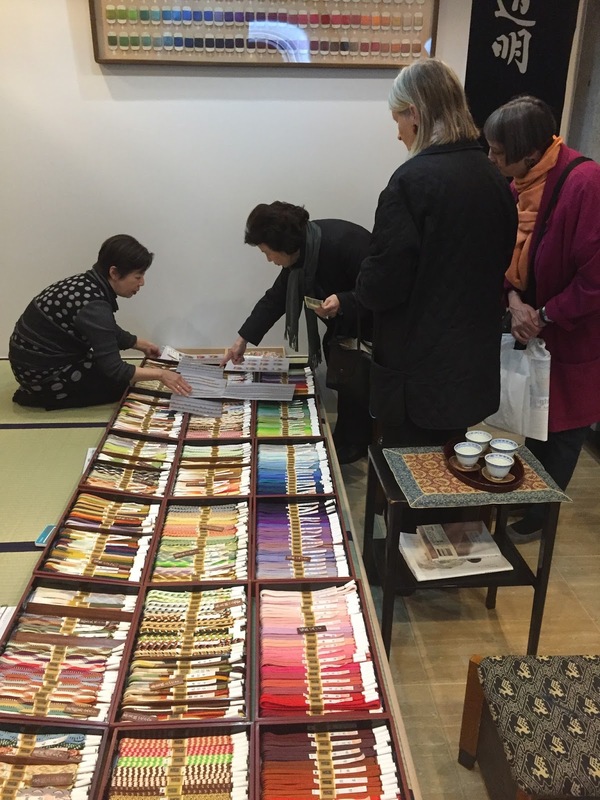 Lady Matsuzaka, Elizabeth, & Robin admire handmade belts that are specifically to wrap around an obi, the material that wraps around the waist of a kimono. These belts are passed down in families to younger generations. Or at least they can be if they are high quality like these. This is a very famous shop and has been here for 340 years, although remodeled recently. In the future, I will make sure buy all of my Obi belts here. 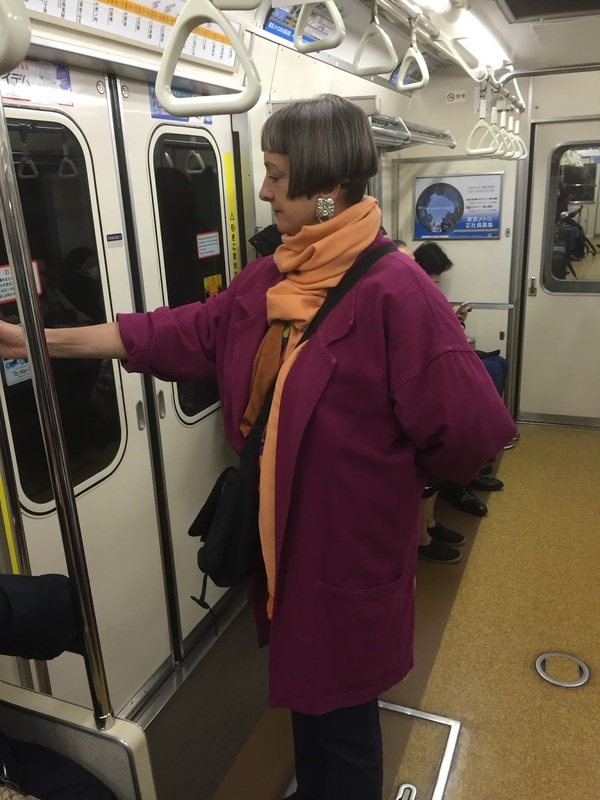 If you're lucky you might catch a sighting of a beautiful young American on the subway. Most subway sightings look more like this. Robin admires a Rodin, seconds before panic-stricken security guard rushes up and saves the sculpture. 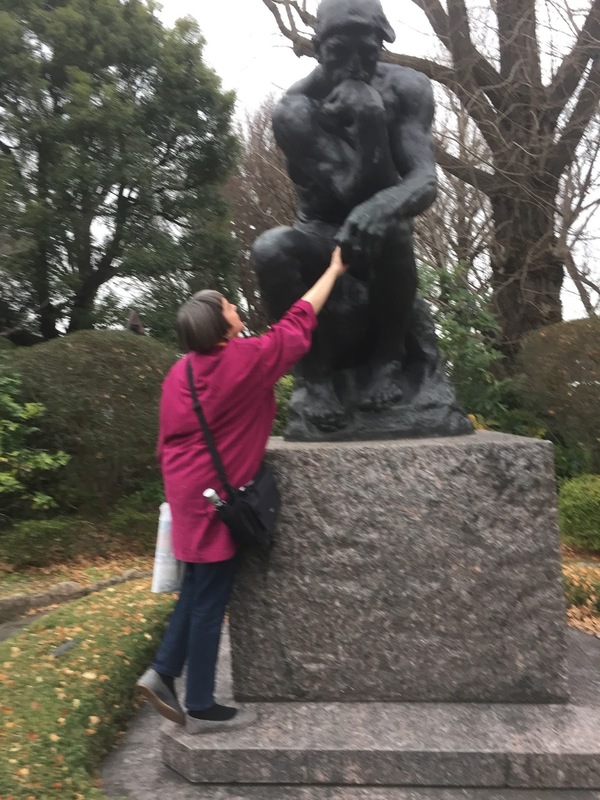 Lady Matsuzaka's grandfather was friend with Rodin and was instrumental for getting this and much more art to Tokyo. His collection is in a separate wing of the National Museum of Western Art. Getting around Tokyo is easy. Just check the map in the station. 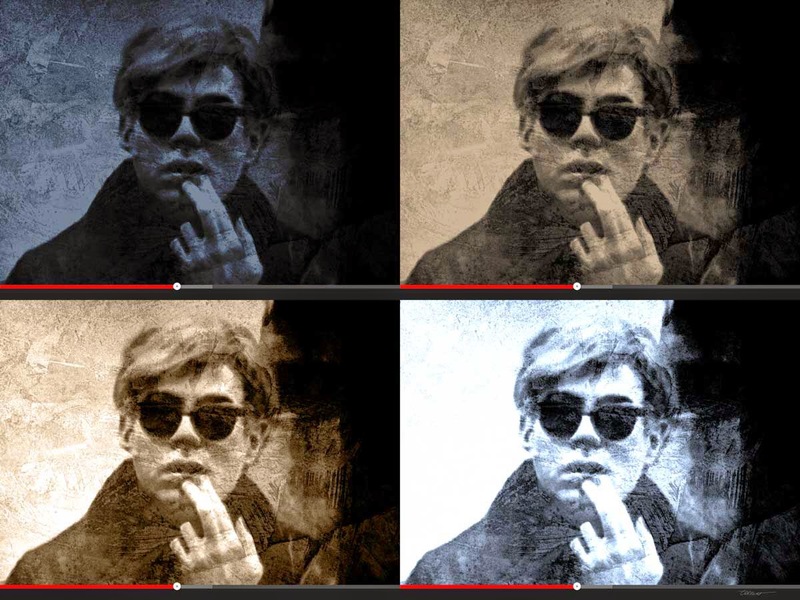 After leaving San Francisco and returning home to Santa Fe something made me think of Andy Warhol and I found several documentaries about him on YouTube. For the next couple of days I worked on images inspired by the video but was mostly inspired by his unapologetic attitude about his art. As critics analyzed, criticized, and scrutinized his work, he seemed totally oblivious (publicly, at least) to the art world's opinion. I grabbed a video frame in the YouTube player and made four panels, each one 40" wide and 30" deep. Next they’ll be digitally printed on aluminum with a high gloss finish to simulate viewing video on a computer screen. Then they will be assembled together to create a single piece that measures 80" wide and 60" deep. So, when someone says to me “You’re copying instead of creating something new,” I can say “So what? It gives me something to do.” Besides, Andy never put a red progress bar on his images. 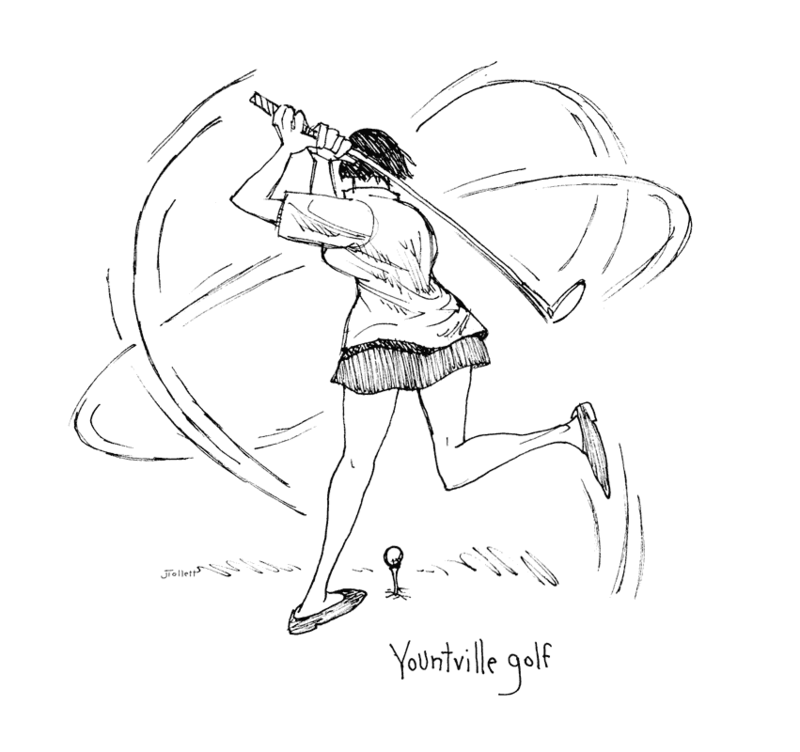 This morning Robin and I went to the Yountville golf course, got a bucket of balls, and borrowed three really horrible clubs (7 iron, 5 wood, 3 wood) from Dan of the driving range. For her first trip to the driving range she did great. 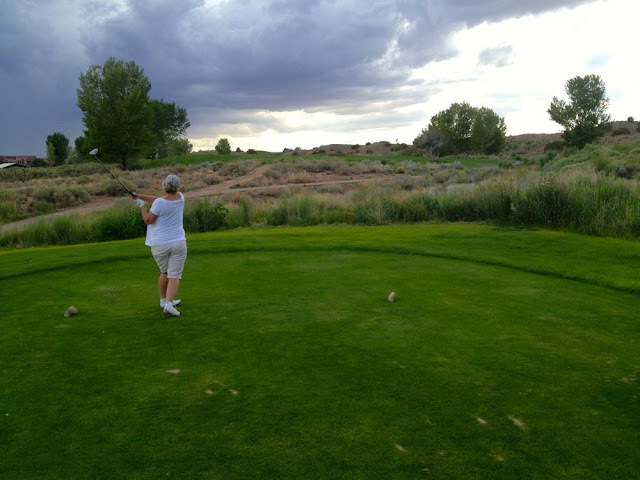 By that I mean she didn't snap her club in half or storm off to the car in disgust. Which means she has lots of potential. 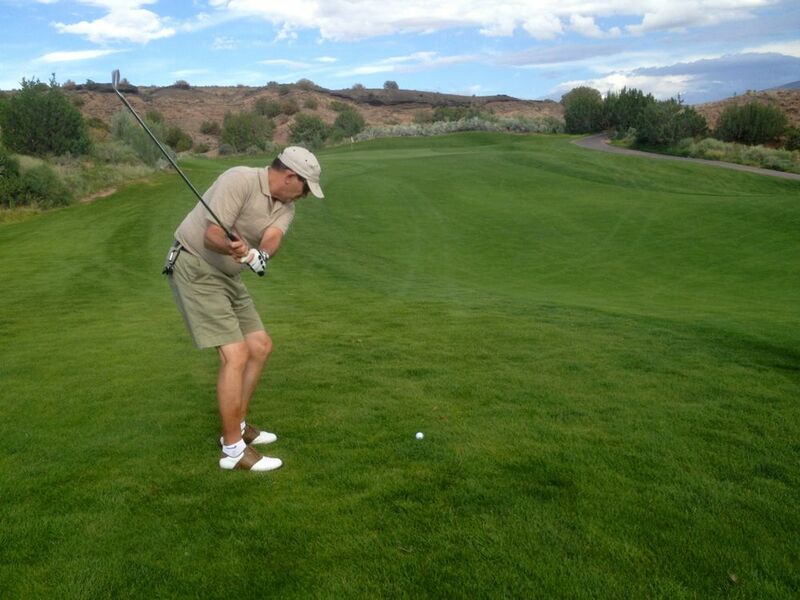 I meant to grab a photo or two, but I was too busy snapping my club in half. So, as soon as we got back to Robin's mother's, I sketched from memory. It often takes several swings to make contact with the ball. Probably because they're still getting some earthquake aftershocks here that can only be felt on golf courses. Just south of Napa, on a hilltop named Vista Point, stands a monumental (really big, larger than life) sculpture of a man using a primitive wine press to crush grapes. You can see it from Highway 29 as you skirt around the south edge of Napa. In the mid to late 1980s I happened to be strolling through the sculpture gardens of the Shidoni Foundry, located in the village of Tesuque, just a few minutes north of Santa Fe, New Mexico. This sculpture was on display in their outdoor sculpture garden, dwarfing everything else there. As I stood there in awe of this massive bronze figure the owner of the foundry walked up and told me that it was going to be put on a big truck and hauled to Napa, California. Years later (mid 90s) I traveled to Napa with Robin to visit her mother. 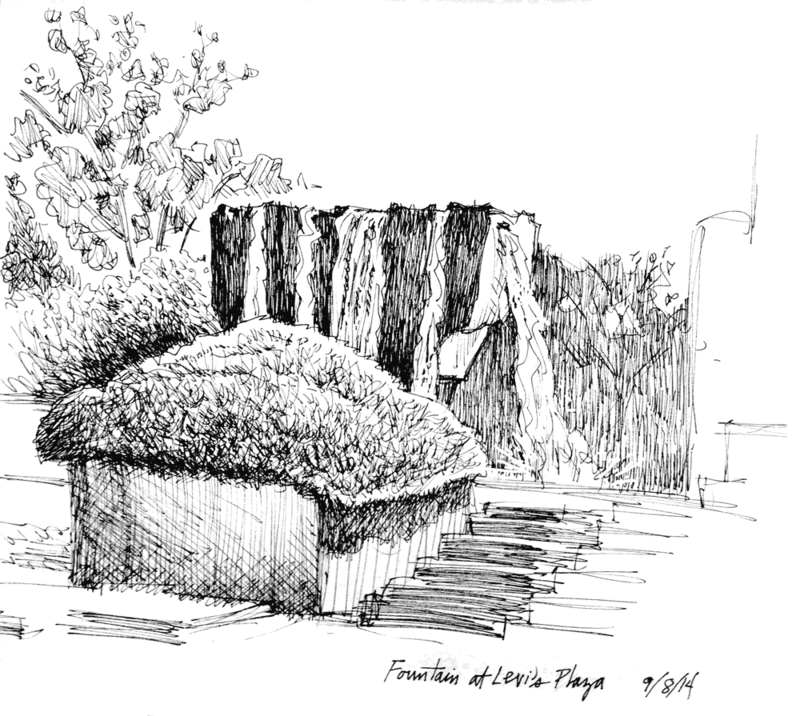 As we approached Napa on Highway 29, I suddenly saw The Grape Crusher standing there in its permanent setting, surrounded by rolling golden hills and vineyards. We’ve driven by it many times since then. On this trip we finally made time to drive up the hill to see the sculpture up close and enjoy the small park and surrounding scenery. 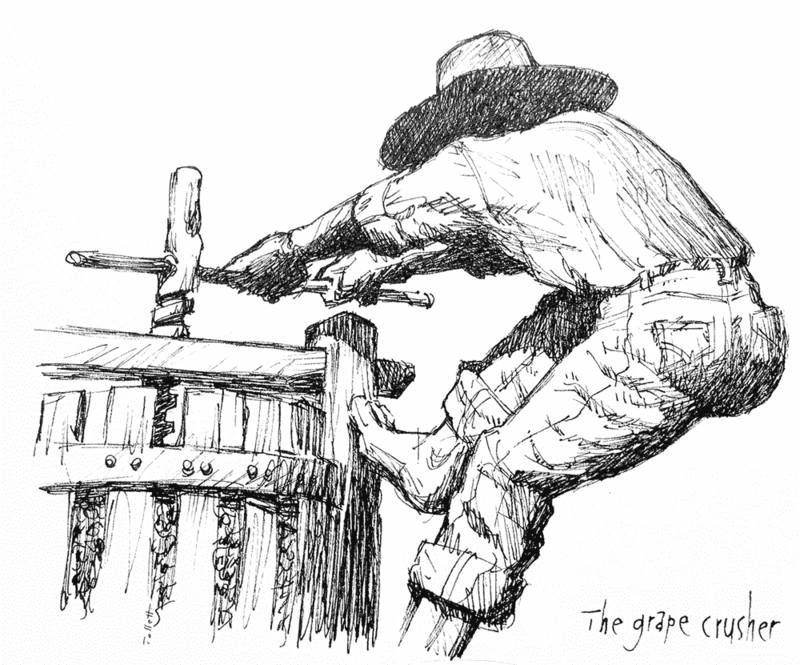 While Robin read a book I picked out a spot and sketched the grape crusher. The mid-morning light fell perfectly and dramatically across the bronze. Great sculpture. Beautiful day. Nice memory. A final evening in San Francisco before we ferry north to Vallejo and on to Yountville in Napa Valley wine country. We walked from Fisherman’s Wharf to North Beach, an older-yet-thriving neighborhood known for its 1950s Beatnik roots, where we planned to meet long-time friend Jimbo for dinner. 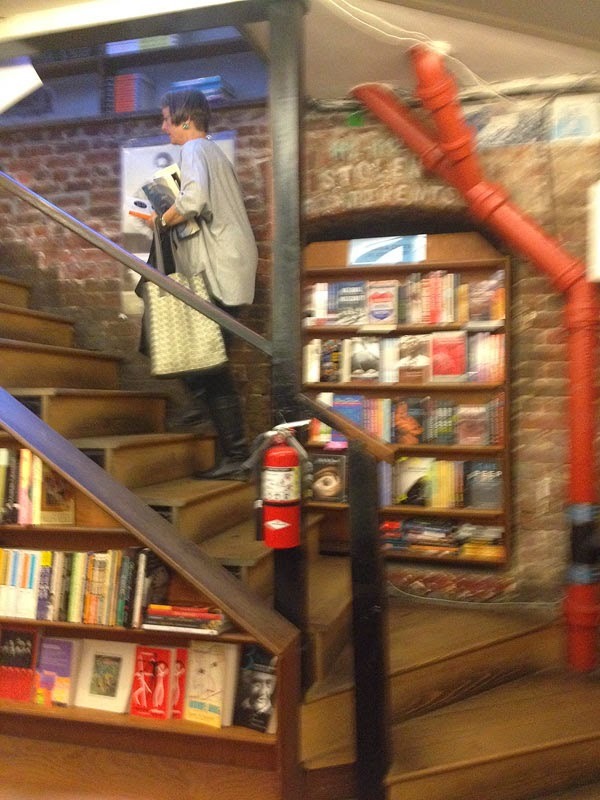 First stop was City Lights Bookstore/Publishers, founded in 1953. It became very famous for publishing Allen Ginsberg’s Howl and Other Poems, which resulted in an also famous obscenity trial. From its beginning, City Lights has been a center of protest and revolutionary ideas. Ginsberg continued to use City Lights as his base of operations for the rest of his life. 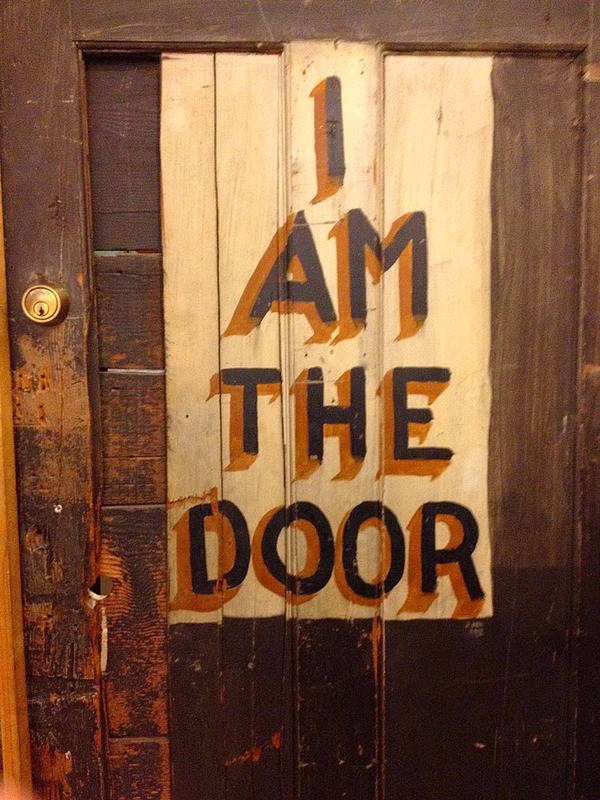 that this is a hangout for philosophers, poets, and intellectuals. 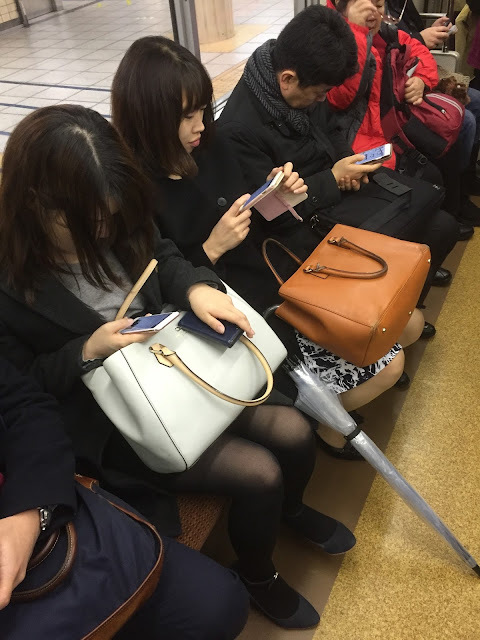 Is it just me, or is something profound happening here? 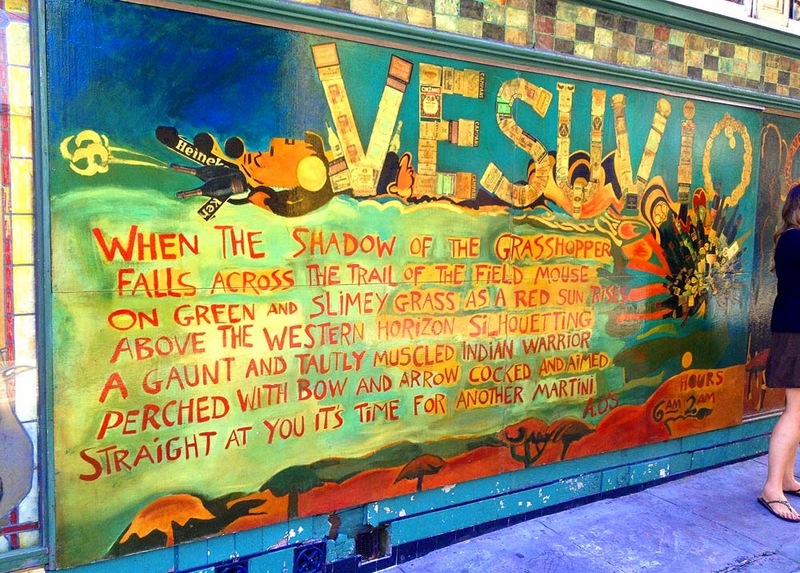 The Vesuvio Bar is next door to City Lights Bookstore. North Beach is still cool, man, cool. After buying several books, including Joseph Conrad’s Typhoon and Other Stories, we wandered into Caffe’ Trieste to have coffee and wait for our dinner date with Jimbo. The walls of Caffe’ Trieste are covered with ’50s-vintage photos. Also photos of Francis Ford Coppola working on his Godfather script in the caffe. 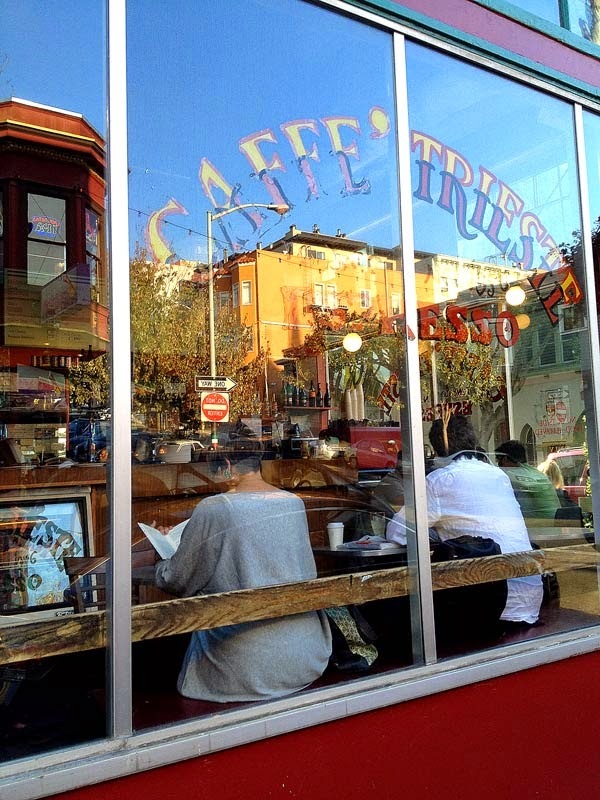 You might wonder, as we do, why Caffe’ Trieste has an apostrophe after “Caffe.” Good question, but if it’s on the window glass that way, that’s good enough for me. I noticed the guy sitting at the table next to ours: his long hair was pulled back into a pony tail, he had long fingernails painted blue, and he was hunched over a journal, writing furiously and with great intensity. Trying to not invade his privacy I leaned over a bit and saw that he was writing in print, not longhand, and each line of print was equivalent to 3 point type, maybe smaller. Almost too small to see. Every page was totally filled from edge to edge, top to bottom, with tiny, tiny print. He seemed flattered and touched his hand to his heart. He showed us some other pages in the journal in which he had varied the typographic design: tiny print, but with an occasional larger phrase enclosed in a hand-drawn border; or a page with tiny print and several lines with more open line spacing; and other pages that had tiny print with some lines of text that were wavy instead perfectly straight. 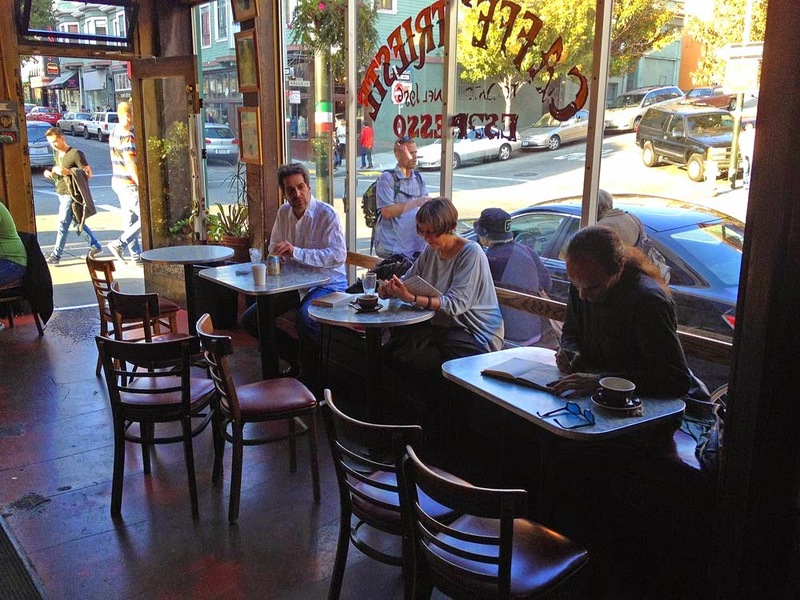 Three Writers in Caffe’ Trieste: another journal writer (left), Robin, and Jessie (right). I introduced myself and Robin. He introduced himself as Jessie. I said “That’s incredible, Jessie. Really beautiful. Love it.” Jessie nodded and touched his heart. The journal was probably more than two-thirds full of tiny hand-written print. Robin asked him what he was going to do with it when it was finished. “No!” we protested. “You need to scan every page so there’s a record of it.” No matter what the text said, genius or crazy, boring or brilliant, I thought it was an amazing example of… of… something, I don’t know what. I put four quarters in the juke box, punched some random numbers, and music played non-stop for the next hour: Italian crooners, Italian versions of American Pop music, Willie Nelson, and Johnny Cash. 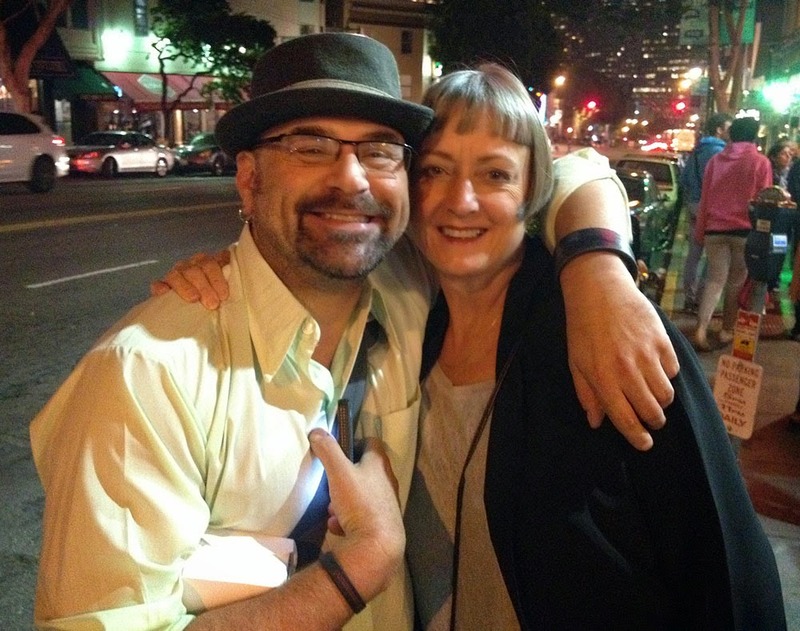 Eventually Jimbo found us and we left Caffe’ Trieste for dinner. I shook hands with Jessie and said “You're awesome.” He smiled, nodded, and touched his heart. Jimbo and Robin, outside an Italian Restaurant in North Beach. 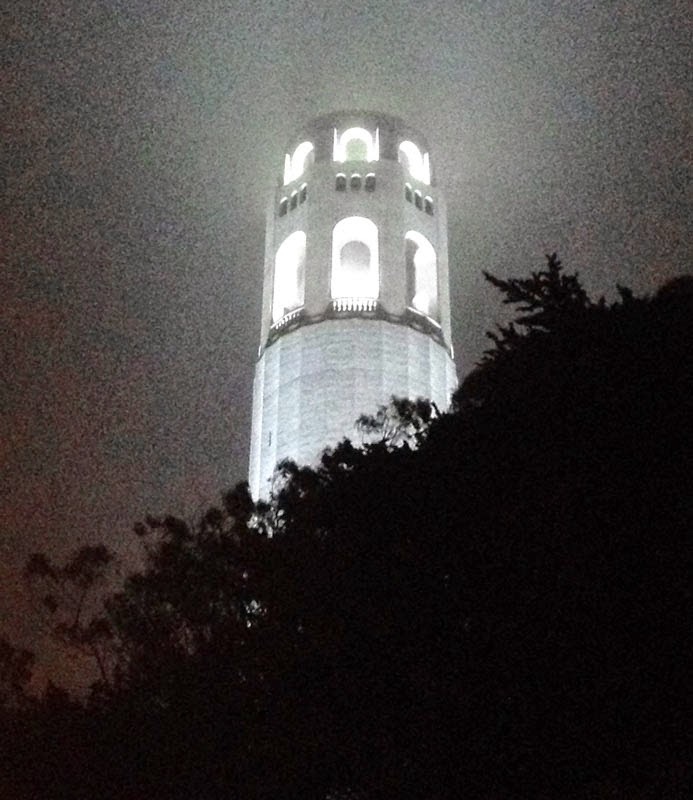 gave Coit Tower a mystical appearance. Robin has been in her publisher's (Peachpit, a division of Pearson) video studio for a couple of days, recording video instructions about design, based on her book, The Non-Designer's Design Book. Pete (producer/editor) and Robin prepare to begin the video session. 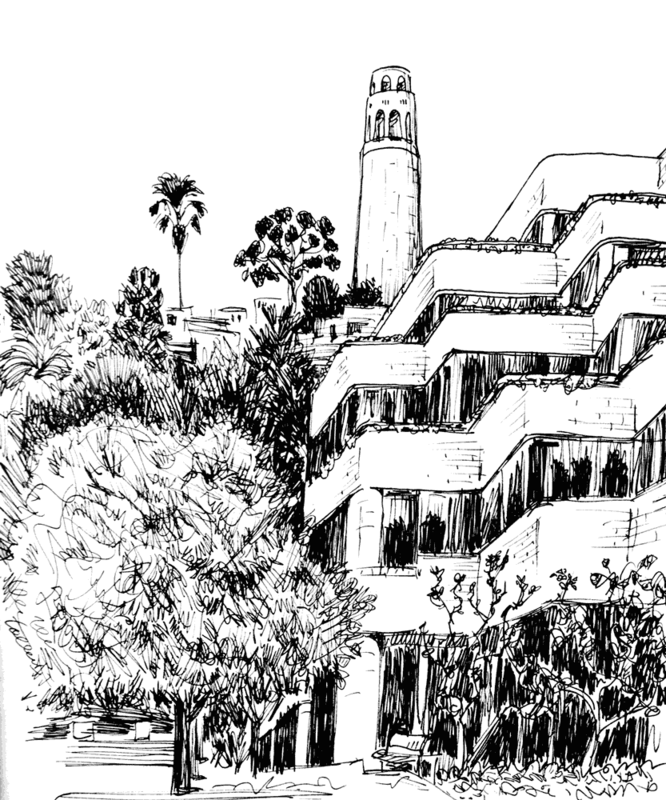 While Robin was busy inside I went out to the Plaza to do some sketching (the Peachpit/Pearson office is at Levi's Plaza, near the landmark Coit Tower). Water flows from all sides of a large boulder. Coit Tower seen from Levi’s Plaza. 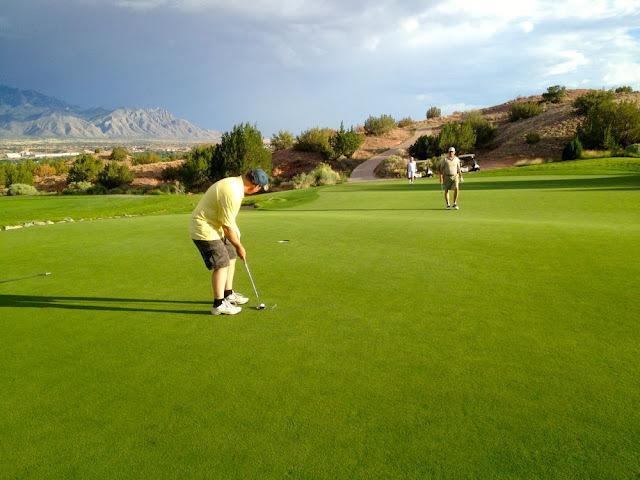 Just north of Albuquerque, NM, is the Hyatt Regency Tamaya Resort and the Twin Warriors golf course, a PGA rated course that hosted a PGA qualifying tournament several years ago. I got an email notice from them advertising a Sunday, 5 pm, Big Hole event featuring a greatly reduced price ($38), double-sized 8" cups on the greens, and Best Ball rules (everyone hits from the location of the foursome’s best shot). 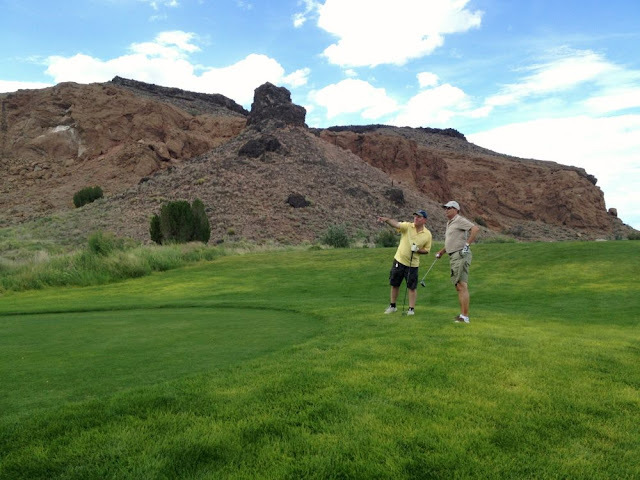 Cousins/pals Jan and Willie joined me at the resort and our partial foursome was rounded out by Greg (former-total-stranger-now-golf-buddy and a dang good golfer to have on your team). The course was spectacular. The weather was perfect. The jackrabbits were cute. 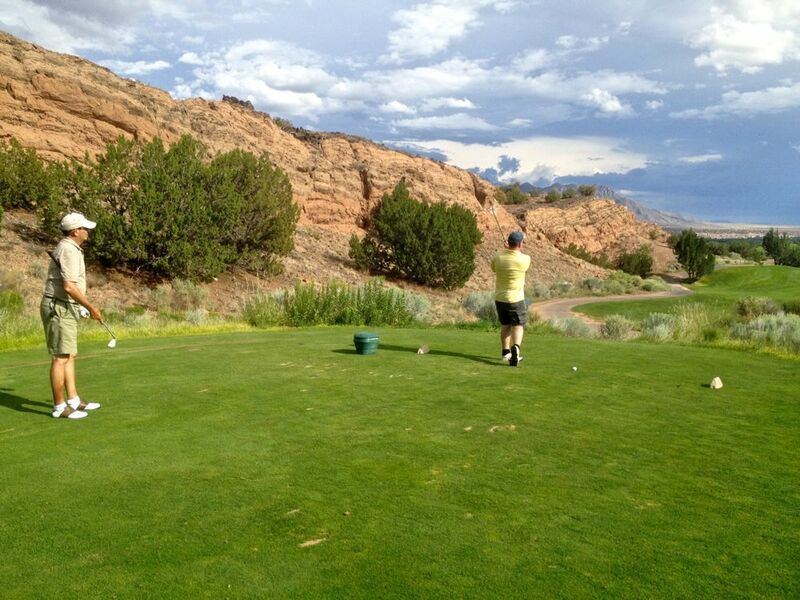 Gotta say it was a great Sunday afternoon. 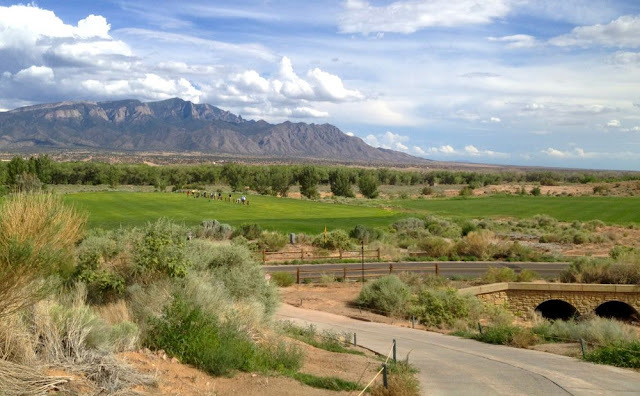 View of Sandia Mountains and the Twin Warriors driving range from the golf cart path that leads to the club house and golf course. Standing on the forward-most tee, looking towards the fairway across an arroyo. 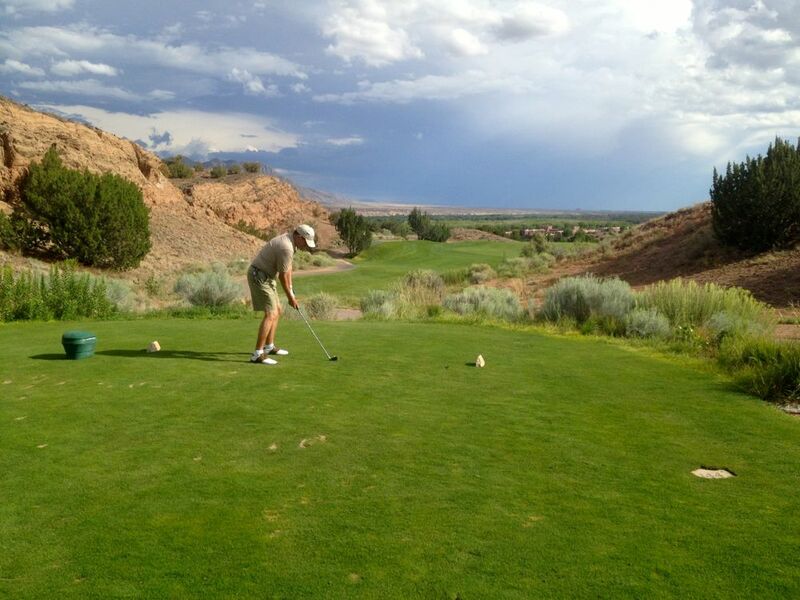 Today I was lucky enough to get the ball to the fairway. Willie aims for the flag. Greg takes a practice swing while enjoying the scenery. The green is way down there somewhere. 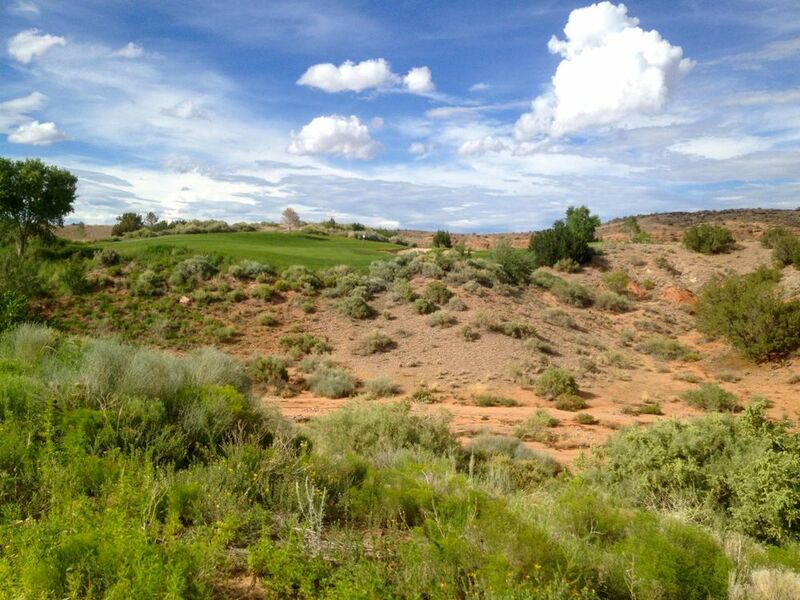 My shot went into the desert hills on the right. Jan's ball in mid-flight. 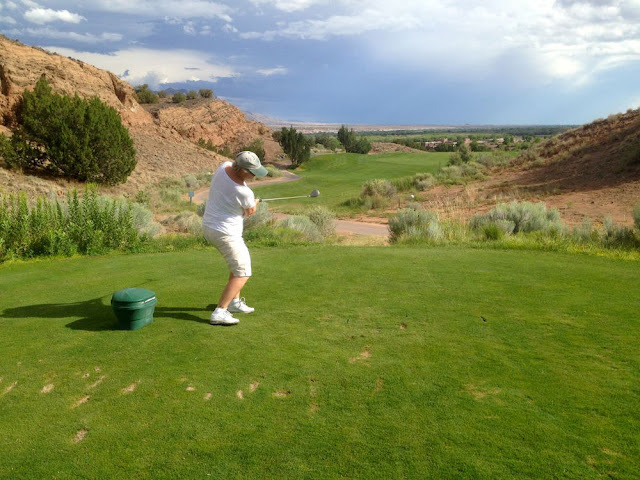 It's a low trajectory, but to the middle of the fairway. Nice. There's a green waaaaay down there. And several giant jackrabbits munching on the lush grass. Jan drives over the arroyo and onto the distant fairway. Sandia Mountains in the background, a large and beautiful green, and a giant, oversized cup.